Our Calgary laser clinic offers non-surgical skin tightening and lifting treatments. Minimally invasive as it heats and contracts the collagen under your skin to make it tighter. Wish the skin on your face was tighter? It can be - with our skin firming laser treatment, Cutera's Titan Skin Tightening. This non-surgical treatment is minimally invasive as it employs infrared light energy to heat and contract the collagen under your skin. The results - a natural, youthful complexion. Able to use on all skin types. 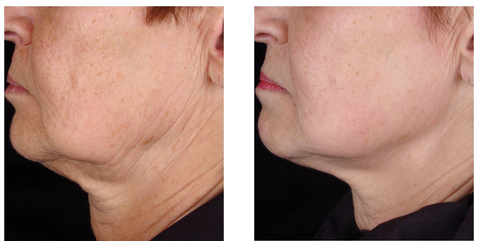 Skin tightening with the Titan uses near-infrared light to correct skin laxity and promotes collagen production. Results vary, but most of our patients require from 1 to 3 treatments. The number of treatments will depend on the severity of the condition treated, which can be best determined through a consultation. Although most patients will see results after every treatment, they will continue to see the benefits of a Titan treatment up to six months post treatment. It takes time to see the results of collagen production, which relies on the body's own natural healing process. The skin will have a pink/red appearance as well as mild swelling which may last anywhere from 20 minutes to 48 hours post. Overall the skin may look and feel warm and tight.